Royal Caribbean has officially opened its dedicated new, arrival and departure facility in Miami, Terminal A. Renowned for its firsts at sea, Royal Caribbean’s new terminal brims with awe-inspiring art installations and the latest technology for a seamless check-in and boarding process that transfers cheerful holiday vibes before boarding. Terminal A is a brand new, state-of-the-art facility built to be the home of Royal Caribbean's newest cruise ship, Symphony of the Seas and her sister ship, Allure of the Seas. The building was designed by England-based global architecture firm Broadway Malyan. Aiming to surpass expectations when passengers arrive for their much-anticipated adventure at this modern architectural marvel, Royal Caribbean International installed a 56-foot-tall gold propellors to welcome everyone into the terminal. The names of Royal Caribbean ships appear on the staircase. The 170,000-sq-ft terminal is nicknamed the ‘Crown of Miami’ because of its distinct shape. Moreover, Royal Caribbean is pioneering the industry’s fastest, smoothest guest check-in at their new Terminal A. Expedited arrival will allow guests to check-in online in just a few steps, hand off their bags and go from “car to bar” in mere minutes, without lines or paperwork to fill out. There is a streamlined Expedited check-in, an interim process that will be nearly as quick. As guests arrive, an agent in the parking garage or drop-off zone will get them cleared to board before they’ve even entered the building. 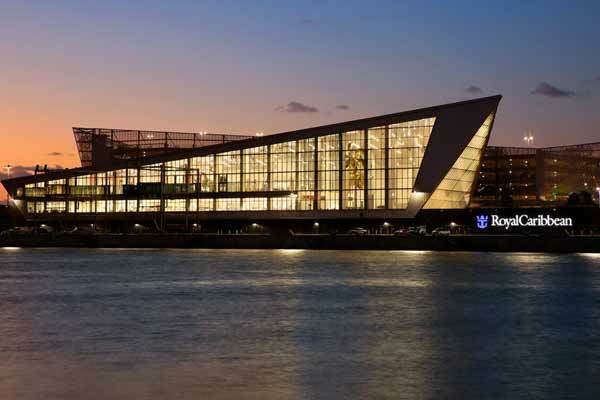 Mohammed Saeed, general manager for Royal Caribbean International, Celebrity Cruises and Azamara Club Cruises in the Middle East, said: “Terminal A acts as a pre-embarkation experience teaser for our ships. A seamless boarding process, high-tech terminal services and beautiful art installations are just some of the things that reflect our brand’s ingenuity toward exceeding our passengers’ expectations”.